New advanced tread compound frovides long original mileage and low rolling resistance. 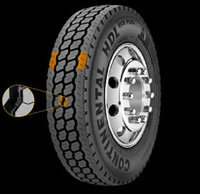 Closed shoulder tread design provides even tread wear while still providing excellent traction. Stone ejection system reduces stone retention and casing penetrations. 28/32 tread depth for optimized mileage and rolling resistance.